We have partnered with Affirm to give you a simple way to buy the chipper shredder you need now and pay for it later. Affirm is a financing alternative to credit cards and other credit payment products. 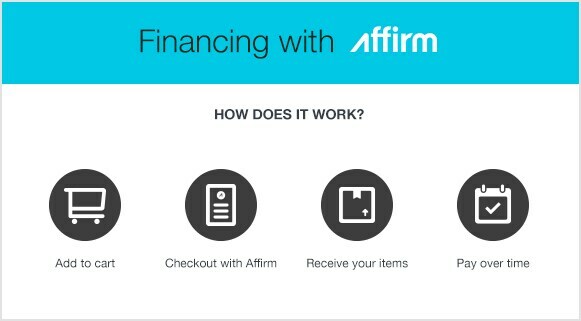 Affirm offers financing for purchases online. With Affirm, you can buy and receive your purchase now, and pay for it in fixed monthly installments over the course of three, six, or twelve months. Shop our site and add what you want to your shopping cart. The shopping cart value must be over $249 to qualify for Affirm financing. Once you're finished shopping, and you've added all of your selections to your shopping cart, check out. As a payment option, select Affirm. You'll be redirected to Affirm. Follow the steps provided there to apply. Once your loan is complete, your order will be processed automatically. 2. Have a valid U.S. or APO/FPO/DPO mailing address (excluding overseas territories). 3. Have a valid postpaid US mobile number that can receive SMS texts. The phone number must be registered in the customer's name, and we cannot accept VOIP numbers at this time. 4. Provide name, email, valid mobile number, birthday and last 4 digits of SSN to help us protect and verify the customer's identity. Affirm performs a "soft credit check" which will not affect your credit score. The soft credit check only allows Affirm to help verify your identity and determine your eligibility for financing. If you apply for more loans with Affirm, we may perform additional ‘soft’ credit checks to ensure that we offer you the best financing options possible, but there is no affect on your credit score. If Affirm was unable to approve your application, Affirm will immediately notify you of the decision and denial reason via a secured message. For your privacy, only Affirm can provide information regarding your financing and application status. If you have an existing account, you may login to your account at www.affirm.com/account or contact Affirm via email at help@affirm.com for further information. Why was I prompted for my checking account information? Affirm sometimes requires additional information to consider a credit application. Such information may include an active checking account, which helps us verify a customer’s identity and ability to repay the requested loan. If the customer was prompted for this information but does not provide it, Affirm will be unable to approve the credit application. Why was I prompted for a down payment? We try hard to approve every purchase with Affirm but sometimes we can’t approve the full amount. When this happens, we provide a debit card down payment option so that the customer may still complete their purchase right away. 2. You will be prompted to enter in your mobile number where you will be sent a personalized security pin. 4. You’ll now see a list of your loans and payments coming due. Click on the loan payment you would like to make. 5. You can make a payment utilizing a debit card or ACH bank transfer. Wood Chipper Financing With Affirm - View Our Shop Chipper Shredders Now and Pay Later With Affirm. Our chipper shredder how-to library can help you pick the perfect electric chipper shredder, gas chipper shredder, pto chipper shredder or chipper shredder vacuum.